The fact that the inventor of dynamite created the Nobel Peace Prize is an interesting contradiction in terms. Of course, the explosive has many other uses than in battle but the oxymoron just adds to the mystique of what is considered by many to be the most prestigious award that can be bestowed on a person. Swedish chemist Alfred Nobel (1833-1896) bequeathed his enormous fortune from the invention of dynamite and 354 other patented inventions to a foundation to fund the Nobel Prizes. In addition to the Peace Prize, awarded every Dec. 10 – chosen because it was the day Nobel died -- in Oslo, Norway, Nobel prizes are also handed out in Stockholm, Sweden, for those people or organizations who have made the greatest achievement in the fields of physics, chemistry, physiology or medicine, literature and economic sciences. The prize will be awarded this year, as it has since 1989, in Oslo City Hall. 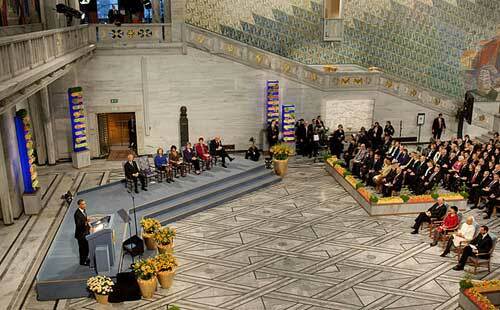 Some 1,000 guests, invited by the Nobel Foundation, will watch as the Norwegian Nobel Committee presents the award. It’s tough to get a ticket to the ceremony itself but don’t worry if you are not a member of the Norwegian royal family or the cream of Norwegian society. There is much celebration before, during and after the event that is open to the public. The ceremony is broadcast live. Catch it on TV anywhere in Oslo. And, there is a Nobel Peace Prize Concert at the Oslo Spektrum the next day that attracts many celebrities. Booking early has many advantages. 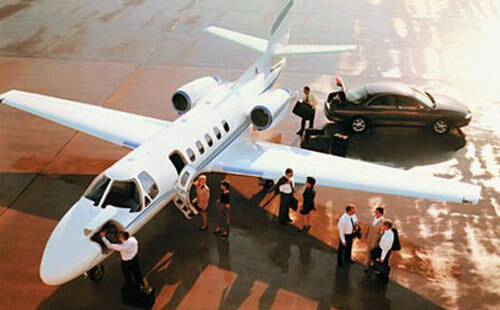 Enter a few details below to start planning your private jet flight to the Nobel Peace Prize Award Ceremony. Malala Yousafzai and Kaliash Satyarthi at the Nobel Peace Prize ceremony in 2014. Picture Source. Alfred Nobel was born in Sweden but he lived all over the world. He called all these places home for a time: St. Petersburg, Russia; Paris, France; Stockholm, Sweden; Germany and the United States. By 17, Nobel was fluent in Swedish, Russian, French, English and German. Nobel was fascinated with nitroglycerine after meeting its Italian inventor, chemist Ascanio Sobrero, in Paris. After returning to Sweden, he concentrated on developing nitroglycerine. After several explosions, including one that killed his brother Emil, Stockholm forbade his further experimentations, forcing Nobel to move his work to a barge anchored in Lake Malaren. Nobel left no explanation as to why he stipulated the Peace Prize be awarded by a Norwegian committee while all the other Nobel prizes be awarded by a Swedish committee. He did say, however, the nationality of the winner should be given no consideration. The average age of Nobel Peace Prize Laureates is 61 years. Between 250 and 300 people and organizations are nominated for each Nobel Prize every year after organizers send out thousands of letters inviting nominations from qualified and select people. The first Nobel Prizes were awarded in 1901. In 1948, no Peace Prize was awarded, in what appears to be unspoken deference to Mohandas Gandhi, who was killed before the award – mandated to go to a living person -- was handed out. Oh, and by the way, if, after the awards, you want to know how the winner was chosen, you can find out.